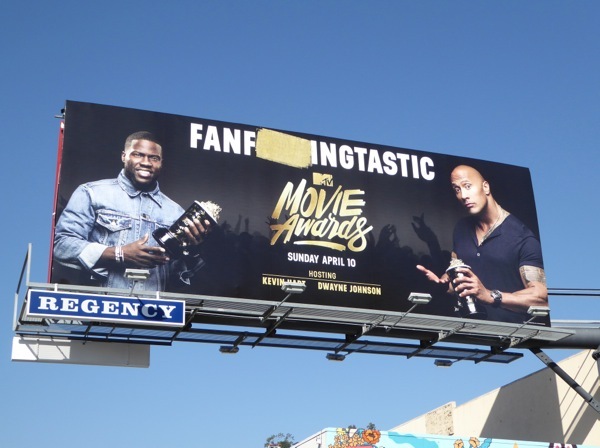 After the controversial 'white-washing' of the Oscars again this year, the MTV Movie Awards are going to great pains to let you know that these are your kind of movies and this is your type of awards show. 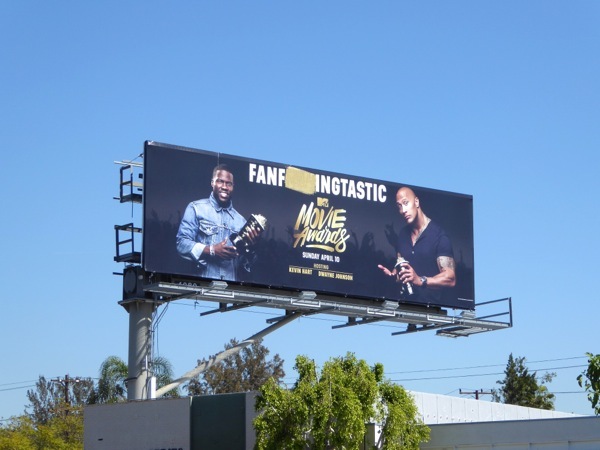 This year's ceremony also score high for fun and diversity with comedian Kevin Hart and wrestling-turned-movie star Dwayne 'The Rock' Johnson sharing hosting duties. 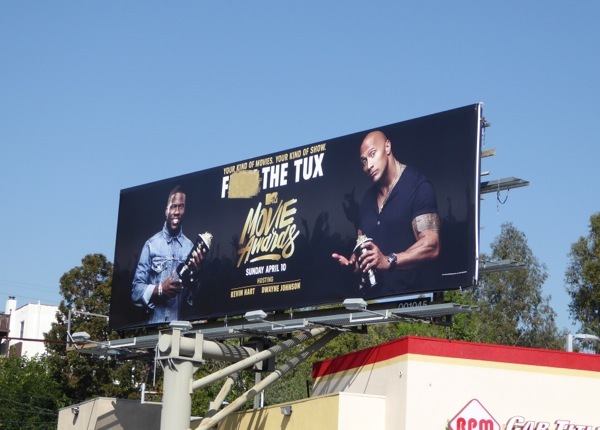 The outdoor ad campaign for the MTV Movie Awards is also a bit tongue-in-cheek with golden blanked out swear word headlines, like 'Fanf***ingtastic' and 'F*** the Tux', language you'd never see promoting the high-profile Academy Awards. 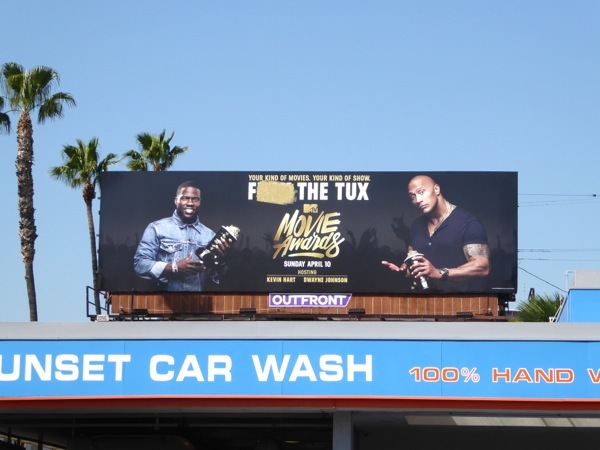 Yes, it sounds like this is one awards show for the masses, no fancy gowns or tuxedos, nominees chosen by MTV and voted for online by the public. No stuffy Academy here. 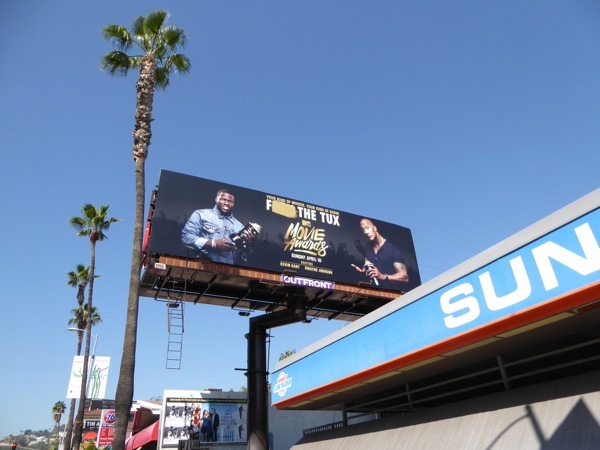 This duo of funny billboards were snapped in multiple locations along Sunset Boulevard, La Brea Avenue, La Cienega Boulevard and San Vicente Boulevard from March 17 to March 22, 2016. 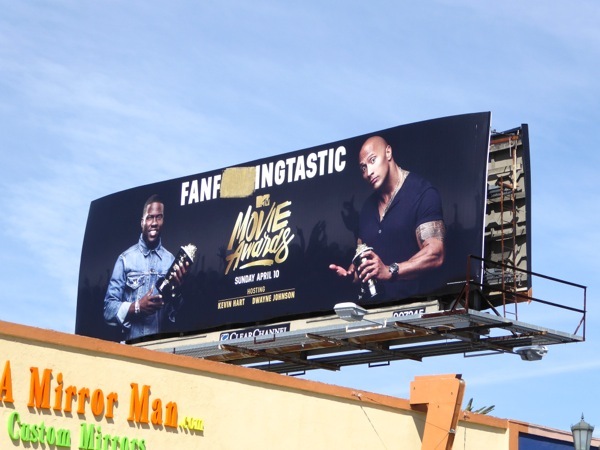 You can also compare these 2016 ad creatives to Amy Schumer's 2015 MTV Movie Awards billboard and the 2014 and 2013 MTV Movie Awards billboards. 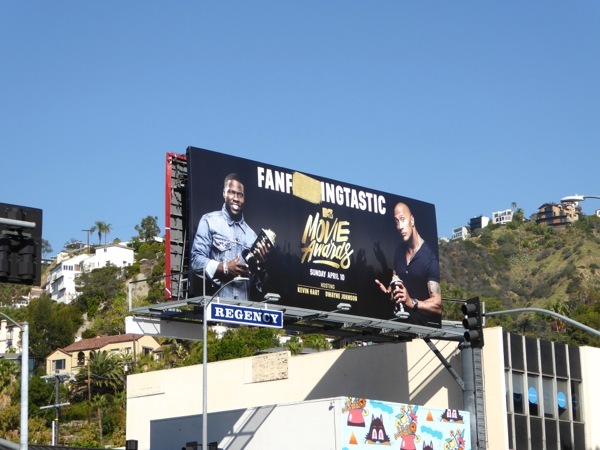 They're much less generic and seem to be everywhere you look this year (MTV are certainly getting their money's worth from their recognisable hosts). 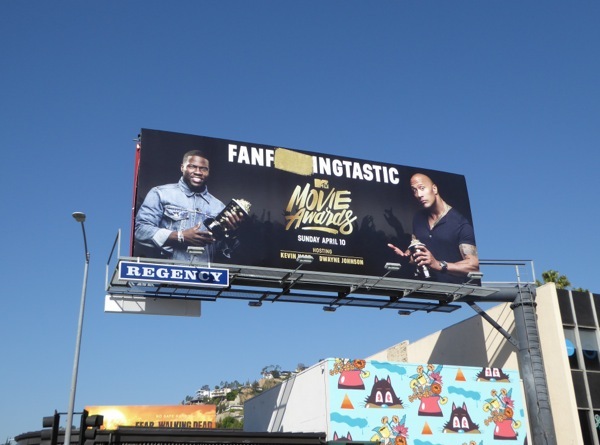 If you're a fan of the funny guy, be sure to check out Kevin Hart in these Ride Along movie billboards, The Wedding Ringer billboards and these Get Hard movie billboards. 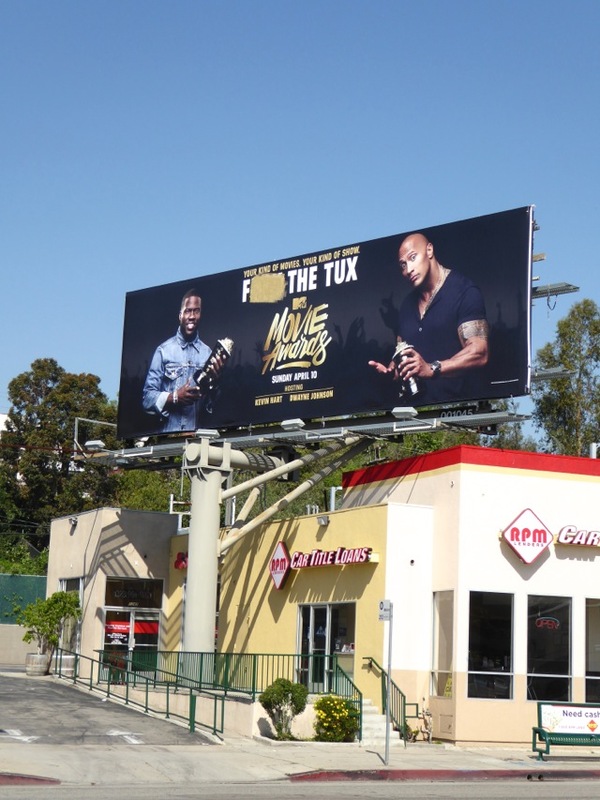 Meanwhile admirers of action hero and WWE legend Dwayne Johnson can also enjoy these Hercules movie billboards, G.I. Joe: Retaliation billboards and Ballers TV series billboards. 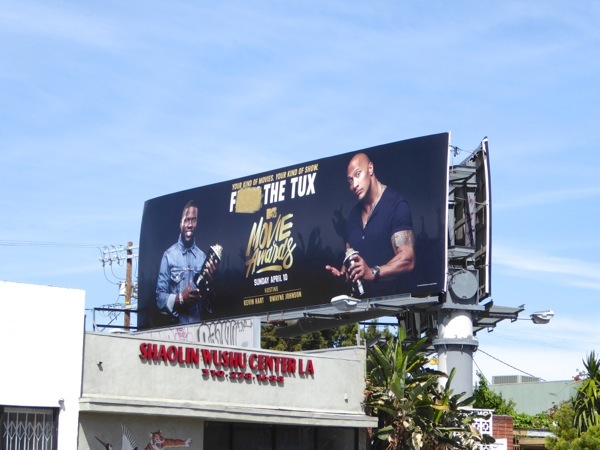 Forget the infamous Oscar statue, it's time for a bucketload of golden popcorn awards to be handed out on Sunday April 10, 2016.